Why should you get excited about Nexsyn, the hybrid soft synth/sample player available starting today from KeyToSound that was developed by Max Groenlund, creator of the Studio 9000 for Koblo? While I could ramble on about Nexsyn’s true stereo signal path, its 4 Gig Big Fish Audio sample library, its ability to load a 400MB piano in 15 seconds, blah, blah, blah, the most innovative and exciting thing about Nexsyn has nothing to do with any of that. It’s got to do with NetNotes. 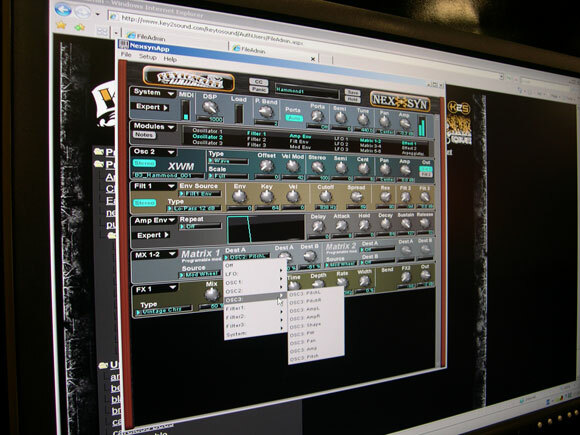 NetNotes is a proprietary browser that lets you audition Nexsyn presets from other users. 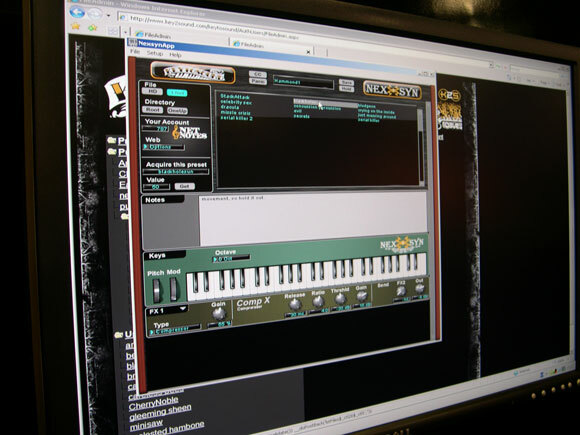 You can play presets via keyboard and even use them in your sequencer. You just can’t save them until you “buy” them. Hold on, relax! You don’t buy other people’s presets with real money, you buy them with NetNotes. You get 1000 NetNotes with your software purchase, which you can use to buy Nexsyn presets. So how much do presets cost? Well, it depends, because the creator sets the price. That means you too can upload your own original presets and set your price. You can even create public and private folders for your preset offerings. This system is bound to exhibit some very interesting free market dynamics, theoretically with simpler presets from novices going for cheap and presets used on Trent Reznor’s latest album fetching top NetNotes. An incentive is created for users to make quality patches available to the community in addition to downloading them. Conversely, if you’ve accumulated 10,000 NetNotes you’ll be able to redeem these for yet-to-be-determined goodies such as professional sample libraries or $100 off a new product release. All in all, NetNotes is an intriguing fusion of social networking and commerce aspiring to offer good sounds and good fun for all. Other companies are sure to take note. $299 street price. Mac OS X or Windows XP. Josh Jancourtz is live on the floor of the NAMM show in Anaheim. We’ll be catching up with his dispatches through the week. And we’ll be sure to revisit KeyToSound’s new instrument once we get our hands on it. NAMM Moog Watch: What is the Sound of One Hand Waving? NAMM: Up Close with Waldorf’s Zarenbourg Electric Piano – Real or Cyborg?